Eyewitness: Robert Waldo Brunelle Jr.
Robert Waldo Brunelle Jr. is known in Vermont as a painter whose vernacular works often feature old houses. It's natural for artists to paint what they see, and this one was born and raised in Rutland, a town that boasts many a fine Victorian structure. In fact, Brunelle has a keen eye for architecture and knows a lot about it; he worked the subject into the art classes he taught for more than 30 years, he says. 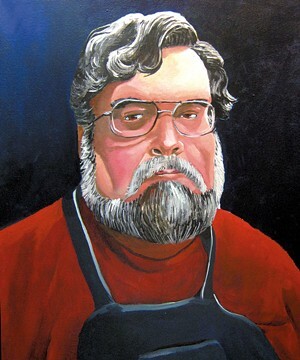 What some fans of his paintings may not know is that Brunelle, 56, is also a longtime cartoonist. His talking-head strip "Mr. Brunelle Explains It All" reveals a dry wit and a penchant for skewering political follies, not to mention the general silliness and self-absorption of humans. His 2014 collection is a self-published volume titled Thank You, Ironic Snowman! All of these skills and interests have conspired to yield Brunelle's latest book, which is about what he can't see: ghosts. The Lesser-Known Haunted Houses consists of "amusing stories and drawings," as he puts it, about buildings with unfortunate spectral inhabitants. 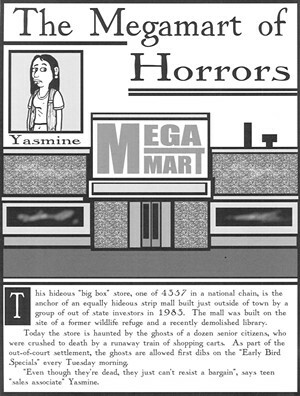 Not all of the 50 vignettes involve houses in the strict sense; Brunelle has also envisioned a supernatural ice shack and auto-repair shop, a vampire-owned TV "sales & service shoppe," an artist studio belonging to one "Claude Pretense," a ghost-rental agency and an ancient tomb "stuffed to the rafters with artifacts stolen from other tombs," among other possessed premises. Brunelle's darkly humorous stories are rife with puns and sly references; some are laugh-out-loud hilarious. In a spidery font that recalls the ghoulish writer and illustrator Edward Gorey, he relates how each building came to acquire its apparition. 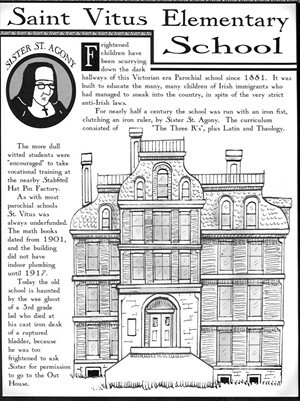 Saint Vitus Elementary School, for instance, "is haunted by the wee ghost of a 3rd grade lad who died at his cast iron desk of a ruptured bladder, because he was too frightened to ask Sister for permission to go to the Out House." 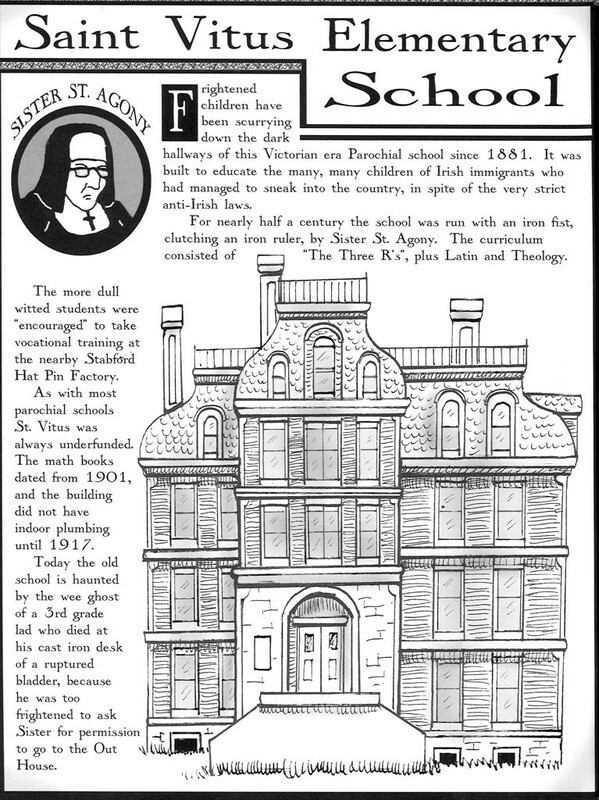 A looming, four-story Victorian dominates the page, while, in a circular frame at the top, Brunelle gives us a headshot of the grim-faced Sister St. Agony. This modest ranch style home, built in 1973, has the highest concentration of pure evil in the state. It was built atop an ancient Native American burial ground by a coven of witches, using materials salvaged from a sunken pirate ship, and was later rented out to a serial killer. The walls bleed, the hall closet is a portal to Hell, and the entire house levitates off its foundation whenever the moon is full. 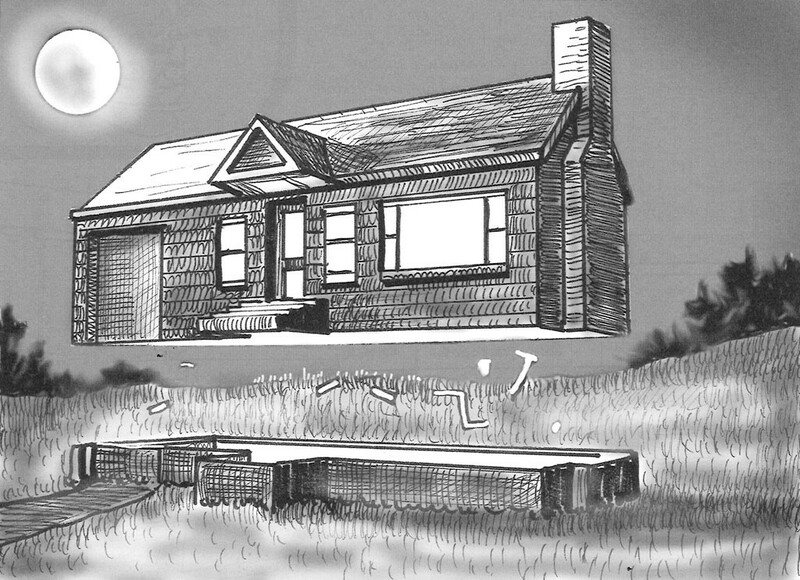 The house, which Brunelle's drawing shows in its hovering phase, "is a great 'starter' home for some young people who are handy with a hammer and a vial of holy water," chirps real estate agent Susie Perk, also depicted on the page. Brunelle declares that the stories, and the houses, are all figments of his imagination. 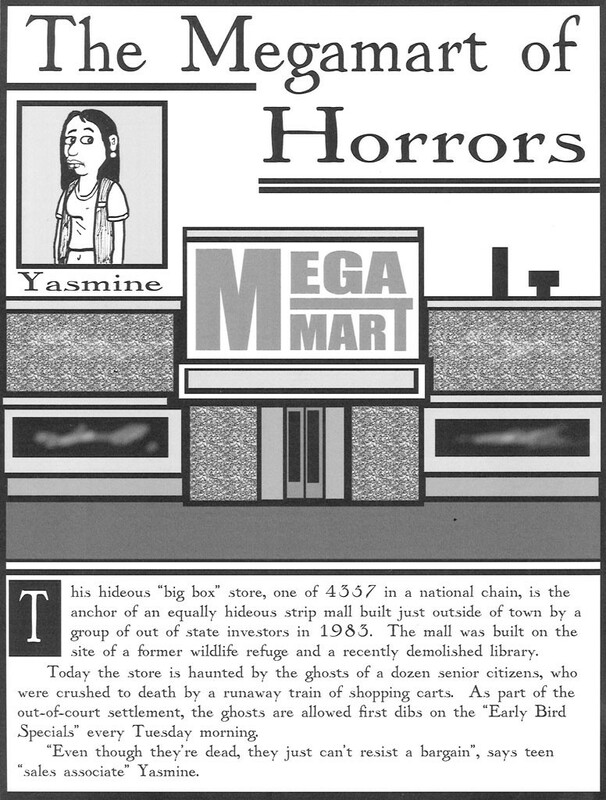 (Don't go looking for the Megamart of Horrors, where the ghosts of a dozen senior citizens still get first dibs on early-bird specials.) Folklorist Joe Citro, who wrote an intro to Lesser-Known, suggests that one story may have been inspired by an H.P. Lovecraft tale. Another is clearly a take on the true story of the Eddy brothers, Vermont mediums during the Spiritualist craze of the 1870s. Citro, Vermont's regional expert on all things weird, has enlisted Brunelle to illustrate his own forthcoming book, The Vermont Ghost Experience. The artist's ability to conjure up buildings was key. "In the intro, I talk about the relationship of 'haunt and habitat,'" Citro says. "I come up with the haunt, and Robert builds the habitat. In some cases he will be recreating vanished buildings; in others, he'll be illustrating buildings that were planned but never constructed." The Lesser-Known Haunted Houses is rendered in dramatic black, white and shades of gray. By contrast with these ink drawings — some created digitally — Brunelle's paintings seem inspired by the fauves: His color palette is unflinchingly vivid. Style-wise, he is most frequently compared to American realist painter Edward Hopper — whom Brunelle does regard as an influence. But the somewhat folksier look and content of his paintings are all his own. "He is in Vermont, and he exudes that quality that Vermonters have: kind of DIY, and [with] a rich understanding of his history and where he comes from," suggests Christy Mitchell, owner of Burlington's S.P.A.C.E. Gallery. She adds that Brunelle's paintings "have a kind of sadness to them, in my opinion, that is intriguing." Brunelle has exhibited paintings at Mitchell's gallery frequently in the past, but his solo show there next summer will focus exclusively on his "kinetic sculptures." Also brightly painted, the wood assemblages with moving pieces look part toy, part machine and all gleeful thingamabob. Recently, Brunelle has been using a residency at Burlington's Generator to laser-cut gears for these creations. He likes to joke that he's employing the new technology without cutting his fingers off or burning down Memorial Auditorium. So far. Though Brunelle hails from Rutland — "My family has lived there since 1905," he notes — he's resided for the past couple of decades in Jericho. A graduate of Saint Michael's College in history and fine art, Brunelle went on to get a master's in education and then inculcated youngsters with "art history, animation, cartooning and the four basics [of art]" at Browns River Middle School in Jericho from 1981 to 2012. For 16 years, Brunelle was president of the Northern Vermont Artist Association, on whose board he still serves. During that time, he wrote and illustrated a history of the organization that was published by Kasini House in 2009. When he's not making art, he says, "I spend my time annoying my neighbors by playing my violin." Brunelle continues to offer classes in cartooning, drawing and painting at several sites around the state. To the best of his knowledge, none has been haunted. The Lesser-Known Haunted Houses and other books by Robert Waldo Brunelle Jr. can be ordered at lulu.com. More info at mrbrunelle.com. The original print version of this article was headlined "Homes and Haunts"